Thankfully, I visited the grand opening of Porsche’s new $100 million North American HQ on a junket. If I were a customer I’d have spent all of my own money getting lessons on their backyard track, strengthening my neck in their fitness center, and putting Poltrona Frau leather on everything I own. That $100 million to build their new HQ? I imagine they’ll get a full return on their investment in, oh, about the first three hours. Technically, the giant LEED-certified building complex located at the end of one of ATL’s big runways on the grave of Ford plant is an office building. Sure, it looks like the kind of HQ that the Empire in the Star Wars universe would build if they suddenly decided to stop terrorizing the galaxy and instead build exciting sports cars and competent crossovers and sedans, but there are fridges full of leftover Mexican food, coffee rooms for venting about Carol’s troll doll collection, and they have an HR department like anyone else. I know this because managed to sneak past security and into the office part of the company. Other than slightly more posters of Group C cars than you’d find in your average service industry cube farm it’s... an office. A nice one, I guess, but an office. Walk through the doors and past the Porsche 917K and your dreams begin. Does your fantasy Cayenne come with a tan leather-lined roof and a blue Alcantara-lined glove box? Well, right through the front doors a lovely German woman will walk you through every conceivable permutation (Porschemutation?) in the “Porsche Exclusive” center. 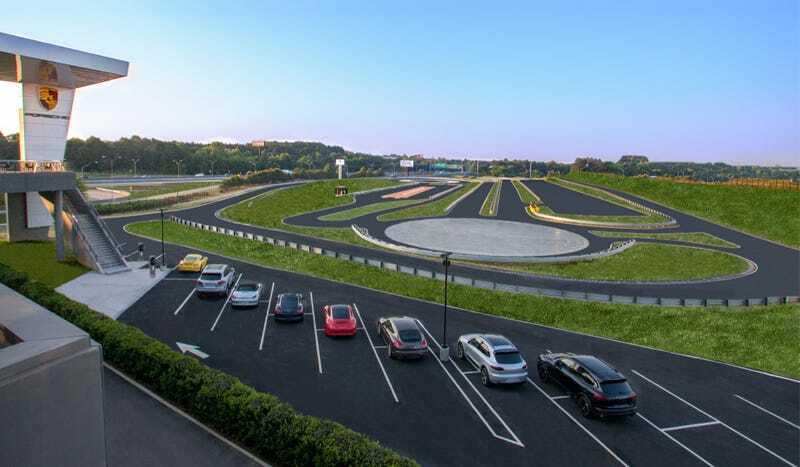 Once you’ve configured your car (up to a four-hour process depending on your desires) you can walk across the bright, open lobby and refresh yourself at Restaurant 356 overlooking the airport and the track. That track. What’s the point of being near a twisty ribbon of carefully elbowed concrete if you can’t drive on it? Thankfully, the 1.6-mile track features a tight and technical handling course and a fleet of instructors willing to train you in everything from intro car control to advanced handling techniques (my favorite part is probably the polished-concrete slide-out sections so you can practice the Stuttgart Slide in your rear-engined sports car). Now that you’ve honed your skills on the on- and/or off-road course, you’ll probably want that sweet Porsche Motorsports polo that the instructors were wearing. And while you’re there it would be silly not to throw in a jacket, a Porsche Design purse and a few other trinkets. Wander downstairs and do your best to hide your erection when you see the Classic Gallery and its rotating parade of delights. Currently, there’s the original 996 GT3 RS press car, a Rothman’s 959 Dakar racer, and enough Brumos race cars to leave even the most stalwart Ferrari fan swollen with excitement. They’ll even put your own car on a pedestal... for a price, of course. Stroll past the Heritage Center and the library (sure to be my favorite place) and there’s a workshop where only the finest Porsche mechanics will look out on the track while working on your pride and joy for prices I dare not even ask. Basically, what they’ve built is a giant magnet designed to separate you from your money. The clever part is that there’s no real disguise here. Porsche knows that their customers love their products and that people who aren’t their customers desire to someday spend $200 painting the valve stems of their new 911 in Geyser Grey. There’s no hard sell in this headquarters. There’s no pressure. Porsche ain’t dumb. They know if you made it past the doors they’ve already got you.